What really matters is how the screenshot help to tell the story, and the connection between the events shown and the events written. Not everyone wants or needs to use screenshots in their AAR. AAR writers are free to choose any balance between images and text which works for you. In some AARs such as Scotland: An Alternative History, pictures alone tell the story of some battles. In others, such as early chapters of The Danish House of Hen, there are relatively few or no images. Making, editing and uploading screenshots takes time which could have been used to edit your text. You might decide that you'd prefer to spend the time on your writing. On the other hand, a well-chosen screenshot can enhance your story. You might notice details in your screenshots which can supply extra elements for your story. Just as an unexpected event on the campaign map or battlefield can inspire a sub-plot, when writers ask ourselves why and how something happened, we can do the same for interesting details in a screenshot. I use the free software Fraps. Before starting your game, simply start Fraps. When the game is running, you'll see a number in the top left hand side of the screen, showing the current 'frames per minute' of your display. This won't appear on your screenshots. Simply click f10 each time you would like to take a picture. The pictures will be saved (by default) in C:/Fraps/Screenshots. If you're playing a Total War game which allows you to save replays of battles, then I suggest taking pictures when watching replays. This means that you can play the battle normally, without being distracted by taking screenshots. In games which have graphics options allowing you to turn off unit banners and other aspects of the user interface, you can also turn off everything which you don't want to appear in your pictures, when watching replays. Alternatively, your game might have a keyboard command to hide the user interface (such as the letter 'K' in Total War: Rome II). In some AARs, you might want to play a short campaign as another faction to obtain screenshots to illustrate that faction's perspective. The events from that campaign might also appear in your AAR. In fact, your screenshots don't have to come from the game at all. Public domain (copyright-free) images, or images which you can use with permission (for example by giving credit to the author) can add something to your AAR. In a historical game, perhaps there's artwork featuring a historical character or location which you're using in your campaign? For years, AAR writers have used image-hosting web sites such as Photobucket or tinypic to host our images. This has disadvantages: eventually the images can disappear or an image-hosting site might decide to start charging users, as Photobucket did, so that images disappear if the user doesn't pay to keep them. There are ways to avoid the problem of disappearing pictures. I recommend using the 'Albums' feature in your personal profile to upload images and getting a code with [img] [/img] tags which you can copy into your chapter to make the image appear. - To add photos to your album, select 'My Profile' and the name of your album, then select 'Upload Photos'. Select 'Add Files', then 'Browse', then the image you want to upload, then select 'Open', then 'Upload', then 'Done', then under the heading Pending Photos select 'Save changes'. Your photo should now appear in your album. For editing, I use the free software Paint.net; others may prefer to use Inkscape or GIMP, or a combination of different image editors. Whether you edit your screenshots, and how you edit them, is up to you. For example, AAR writers often crop out the user interface (or remove it before taking the picture), but some writers prefer to leave the interface in their pictures. You might want to make your screenshots a consistent size and shape, or add a border, or crop out all of the screenshot except for a small area which shows action from your story - or you can post unedited images from the game, it's up to you. You might want to add labels or arrows to help readers understand what is going on. It's easy to assume that your readers will know things which are obvious to you, such as the colours of the clothes and armour which your soldiers wear in a Total War game. Of course, you can remind people in the text of the colours of your faction, or the design of their flag or the type of units they're using, to help readers to follow the action in a battle. Screenshots can be a great way to illustrate important moments in battles. The examples below show that they can be used in other ways, too - and screenshots from battles can inspire an extra dimension to our writing. We have already seen that screenshots from battles don't have to illustrate battles. Here, waveman provides a shot of a group of messengers, which readers agreed is a beautiful image. He tells us about these five characters, identifying them by the weapons they carry. Using details of images (such as the weapons which riders carry) in your story can be very effective. Total War games have their quirks which we might appreciate sometimes and find annoying on other occasions. In Rome II, when the camera gets too close to a warrior, they fade out of view. This screenshot shows this fading process happening. Welsh Dragon might have simply deleted this image and used another. However, in an inspired example of 'turning lemons into lemonade', he made the faded image of a warrior part of his story. The charging warriors believe that their god, Segomo, is charging with them. The the fading warrior in the image represents Segomo and this became a significant part of this chapter, in which the ferocious fanatics of the Eburones (the enemy) are contrasted with the 'band of brothers' of the Nervii (Welsh Dragon's faction). When we get odd or unusual screenshots, we might be tempted to delete them - while this is often a sensible decision, this example shows how an odd screenshot can inspire an extra dimension for a story. Previously, when we looked at Welsh Dragon's screenshot, we saw something which wouldn't ordinarily happen (a warrior fading out of sight). Welsh Dragon took advantage of an accidental opportunity show us something which wouldn't normally appear. If you have played Skyrim, the game used for A Long Way from Home, you might recognise the wizard Farengar Secret-Fire in this image - and you might know that the player can't normally accompany him outside for magic lessons (at least, as far as I know!). Here, Caillagh made an image of something which wouldn't ordinarily happen. This screenshot was only possible through modding. This illustrates the possibilities which mods offer AAR writers, whether they are mods created by others or mods we make to set up specific events or scenes. The reason I recommended that chapter in particular wasn't just because it literally (or indeed perfectly) captures the scene in question. The reason the image is so powerful is because it's one of the first times Robin moved away from screenshots of battles, so set against nearly every other screenshot up until that point in the AAR, it stands out as unique and intimate - moving away from blood and gore and the endless clash of swords, and towards a more romantic tale that goes above and beyond simply retelling every battle of a campaign. This image, in my eyes, encapsulates the struggle we all have in trying to turn a Total War game into a multi-dimensional story (and something Robin grappled with throughout writing Takeda). Also, the juxtaposition between the wide, cold and impersonal screenshot of the castle, and the warm, close up portrait really emphasizes the distance - emotional and physical - between the two characters, and toys with the aforementioned intimacy that the latter evokes. This is about placing screenshots within the context of the overall AAR. How do individual images as puzzle pieces fit together into a larger jigsaw that is an AAR, and what kind of images do they create when they finally come together as one? Why include maps? Because, as the quote above shows, maps show us features which can decide the outcome of a battle or military campaign. They can make the manoeuvres (or maneuvers, if you prefer the US spelling) easier to follow. For example, a map could show why your character's heroic stand in a particular place was so important. Of course, it's common for maps to be included in novels set in fantasy worlds. If we're telling a story set in the real world, we might assume that our readers know the locations and relative positions of places mention. Nevertheless, our readers might become confused and could benefit from being able to see where the places actually are. Even if our readers know where the places are, maps can help to show why events unfold as they do. Popular books about maps, such as Prisoners of Geography by Tim Marshall and A History of the World in Twelve Maps by Jerry Brotton, highlight the impact of geography on the culture and history of nations. Maps in AARs are often centred on a particular battle or campaign. This makes sense, for maps which are intended to help readers to understand that battle or campaign. However, maps can be used for other purposes too. A map can show how a society thinks about the world around them and their place in the world. For example, if you were playing a non-Roman faction in the era of the Roman empire, would your faction's maps be centred on Rome? Your answer to this question could provide subtle clues about your faction's perception of itself. If they fight Rome, do they see themselves as rebelling against Rome as the central power in the world, or does your faction see their own homelands as the centre of the world, with Rome intruding from the periphery? The use of JPEG is discouraged, since it is a lossy compression format and so will result in a blurry map or diagram. The quality of GIF images is better than JPEG. Of course, we might be constrained by factors such as the file types which we can upload. We might want to use a compression format, since this will make the page of our AAR load faster on readers' screens - we don't want to lose readers because they are put off by the loading time! This might simply prompt us to think about the choices we make and their effects, and encourage us to experiment. When using in-game tactical maps, adding extra information - such as the labels 'Edetani' and 'Carthage' here - can be useful. In the previous chapter of this AAR, some readers were confused by a similar tactical map, thinking that the units coloured red were the enemy. 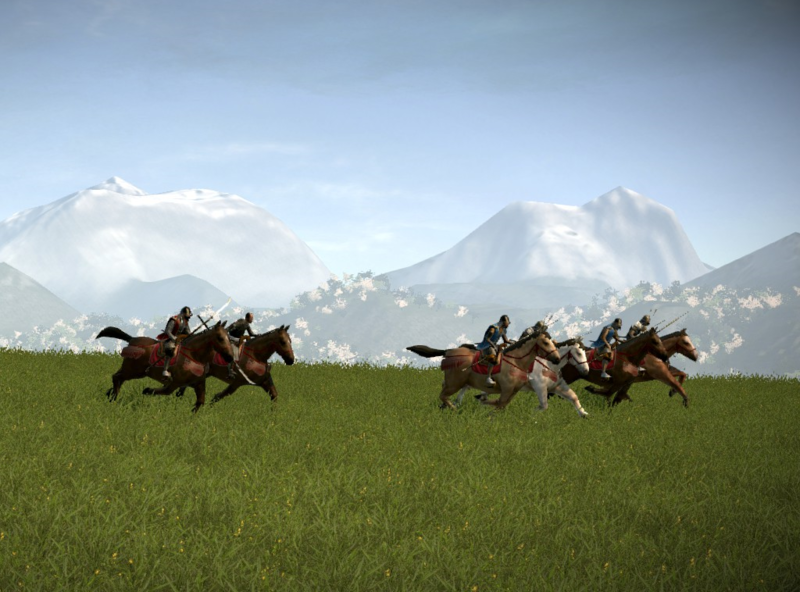 In fact, on Rome II tactical maps, the units coloured red belong to the player. The point is that things which seem obvious to the writer (such as which units are yours) won't be obvious to readers. The map above was influenced by the conventions for displaying units in real-world battlefield maps, such as using differently shaped symbols to represent infantry, cavalry and artillery. You might think about ways in which this map could have been improved. The thin lines representing the 1st and 2nd Foot were deliberate, since those regiments were deployed in thin lines in the battle. The use of a block to represent high ground is not ideal, there would be better ways of representing terrain. Also, the map show the units as static, there is no indication of which units where moving or where. Arrows could have been added to illustrate movement - for example, the 3rd Foot were advancing directly towards the British guns in front of them, while the Irish cavalry were also advancing directly ahead, hoping to charge the British gunners from the flank. 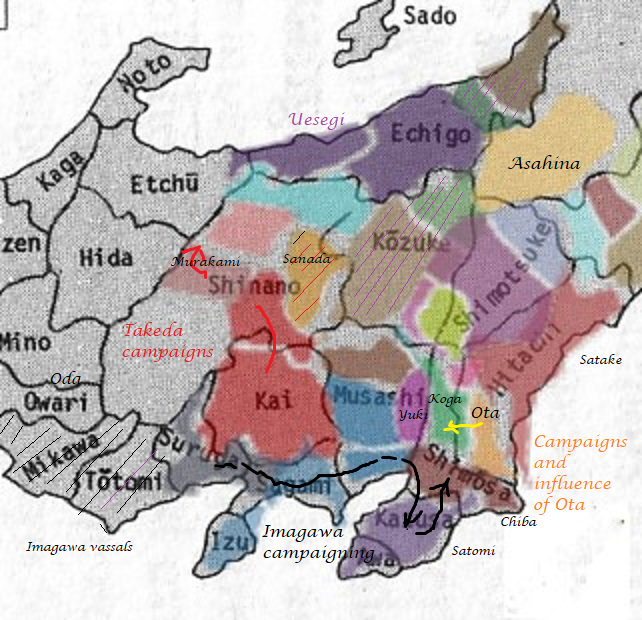 This map managed to demonstrate political relationships (such as the Imagawa vassals) and the military campaigns of several factions (Ota, Imagawa and Takeda) all on a single strategic map. These suggestions are intended for beginners; I'm only a basic user, experts might want to provide your own advice in the comments section below the article. I'll start from the beginning, to show you the steps I use. 1. Start the game, load a save and use Fraps to take a series of screenshots (for example, taking pictues from different angles and using levels of zoom). (c) In the box of icons on the left, select the 'paint bucket' icon. In the 'Colors' box on the right, select the 'arrow' to switch the primary colour to white. Click your cursor inside the box which you made, to fill the box with a white background. (d) In the icons box on the left, select the 'T' (text) icon. (e) In the 'Colors' box on the right, select the arrow again the turn the primary colour back to black. I often forget to do this step and wonder why my text doesn't appear! It is important to do this after selecting the 'T' (text) icon, not before - otherwise your box will be filled with a black background. (If you make a mistake, you can always select the 'Edit' tab and undo). (f) Click inside the box, where you would like the text to appear. Select the font and font size (typing a few letters will help you to check whether your have made a good choice.) Don't worry if the cursor and the text don't appear in exactly the right place, you will be able to move your text after you type it. Type the words which you want to appear in the box. (g) If you want to move the words, for example if they're a bit lower than you would like, hover your cursor over the arrows which will appear near your box. When your cursor changes into a hand, left-clicking and moving the cursor will move the text around. When the text is in the right place, release your mouse's button. (a) Select 'Shapes' from the icons in the box on the left hand side. (b) An extra toolbar will appear on the top of the screen. Select 'Rectangle' and choose 'Arrow' (or whichever shape you want). (d) Click and drag on your map to create an arrow. If you hover your mouse over the box with arrows pointing in four directions, then your icon will turn into a hand. You can then left-click and drag the arrow to any place on your map. If you hover your mouse slightly above or below the arrow, then a curved arrow appears. When that happens, you can left-click and drag the arrow to rotate it. Or there's Ofnuts' path-arrow-heads, in the list here. As always, which method to use depends on what you want to do - and how often you'll want to do it. Arrows are much easier in Inkscape/Paint.Net, but editing a screenshot (over which you might want to superimpose your images) is much easier in GIMP. You might want to use both Inkscape and GIMP. This article has simply provided suggestions about making, editing and using screenshots for beginners. Different methods of doing this work for different people; feel free to comment below on how you do this, or provide your own guide in the Writers' Lounge. Thanks to Welsh Dragon, Hitai de Bodemloze and Caillagh de Bodemloze for your suggestions and advice for this article. Thank you for reading - see you in the Writers' Study! A welcome and value addition to the TWC library of how to articles. Well worth a reread! A wonderful and educational read! As Norsething says a valuable addition to 'how to' articles. I don't plan to write any AAR shortly (not before a certain mod will be released) but when I will I'll certainly come back to check this and other articles on AARs because they are great sources of guidance and, most important, inspiration!